PHARR — The city is looking to merge its 911 call center and put the fire and police communications teams under one roof in an attempt to reduce phone call transfers when citizens call 911 and to improve efficiency. Firecomm, the program where Pharr receives calls for service, does not only serve Pharr. It receives fire calls from McAllen and Progreso as well. Actually, Pharr’s firecomm receives more than double the amount of calls from McAllen than from Pharr, according to a presentation from Police Chief Ruben Villescas at the city’s budget workshop Monday. From October 2016 to July 2017, Pharr Firecomm received 8,846 calls for service. Of those calls, 6,030 came from McAllen while 2,545 were from Pharr, Villescas said. The City of McAllen declined comment on why Pharr receives its fire calls for service. The merging of Pharr’s police and fire communications teams is a proposal right now. It will be up to the city commission whether to move it forward. Villescas said there will be no new staffing or money toward this potential merger. The new money that could have to be spent would be on a new location the merged teams would be housed, which could cost tens of thousands of dollars, depending on what, if at all, the commission decides to do. Pharr also implemented a pilot program on Tuesday for 911 calls from cell phones to stay in Pharr. Sometimes, depending on the cell phone that calls, it can sometimes be bounced to the Hidalgo County Sheriff’s Office, which will then contact the ambulance company. 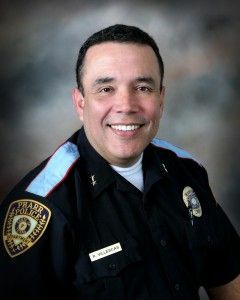 But the pilot program, Villescas said, will make it so those cell phone calls are not bounced and will get through to the Pharr police or fire communications teams. The pilot program will last about a month, Villescas said.